Billericay Town kept their unbeaten record under manager Dean Brennan courtesy of a last gasp Dean Inman equaliser at Hungerford’s Bulpit Lane ground. Blues went ahead in the first half again through Inman. A wonder strike from the Crusaders’ Romone Rose, midway through the second period, and scrambled injury time goal from Joshua Martin saw the home side lead until the final decisive touch of the match. On a mild November afternoon, Hungerford started strongly. Dan Bailey, playing on the left-wing in place of a not fully fit, Darren Foxley, was heavily involved in early exchanges testing Blues right-back, Joe Kizzi, defensively. A foul on Bailey earned Hungerford their first chance as a Matt Jones free-kick from the left hand side was headed powerfully over the bar by Rose. 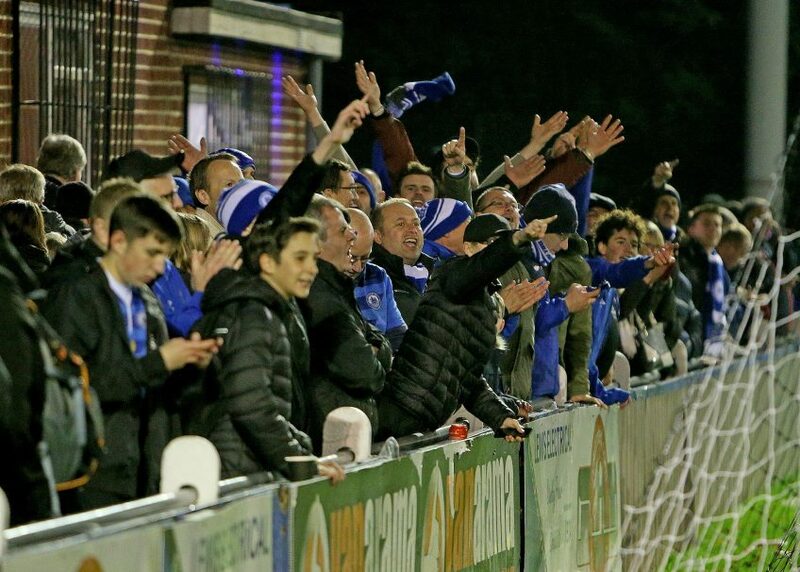 Despite the notable distraction of a first round FA Cup replay on Tuesday night, Billericay fielded a strong side against the Crusaders in anticipation of a tough, competitive fixture. The opening period fully confirmed this expectation as a hungry home side competed strongly in midfield. Pressure on the Blues was apparent as Kizzi was booked on 9 minutes for obstruction of a Bailey incursion. 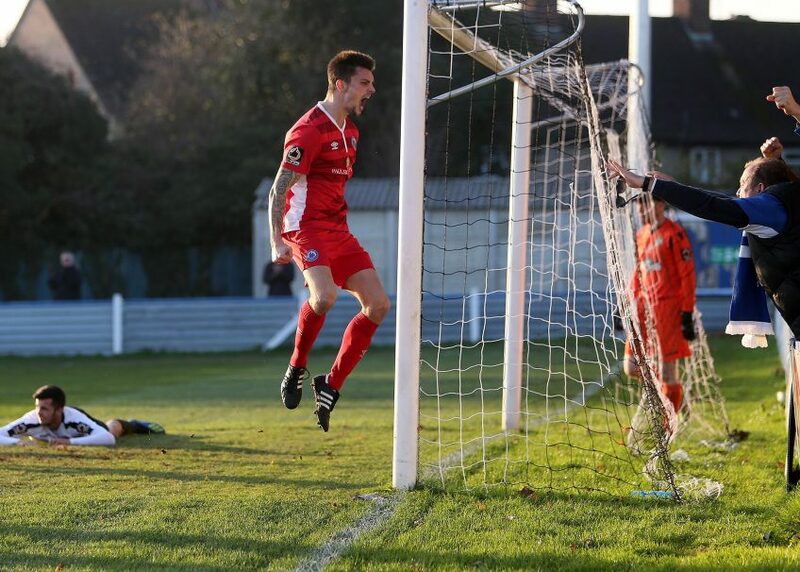 As the match unfolded, Billericay gained in influence and a succession of corners indicated that the tide was beginning to turn in favour of the league leaders. On 17 minutes, a short corner routine involving Jamie O’Hara and Sam Deering would lead to the opening goal. Securing possession on the right hand corner of the penalty area, Deering’s floated cross to the far post was headed home powerfully by centre-back, Inman, who had out-paced the covering defenders. On a tricky pitch, fluency of play from either side was constrained and the best chances were limited to shots from range that failed to test either goalkeeper. A burst from Hungerford right-back, Marcus Johnson-Schuster, into midfield saw him shoot on target straight at Blues custodian, Alan Julian. Similarly, a brief sight of goal for Ricky Modeste ended with the winger shooting well over the bar. 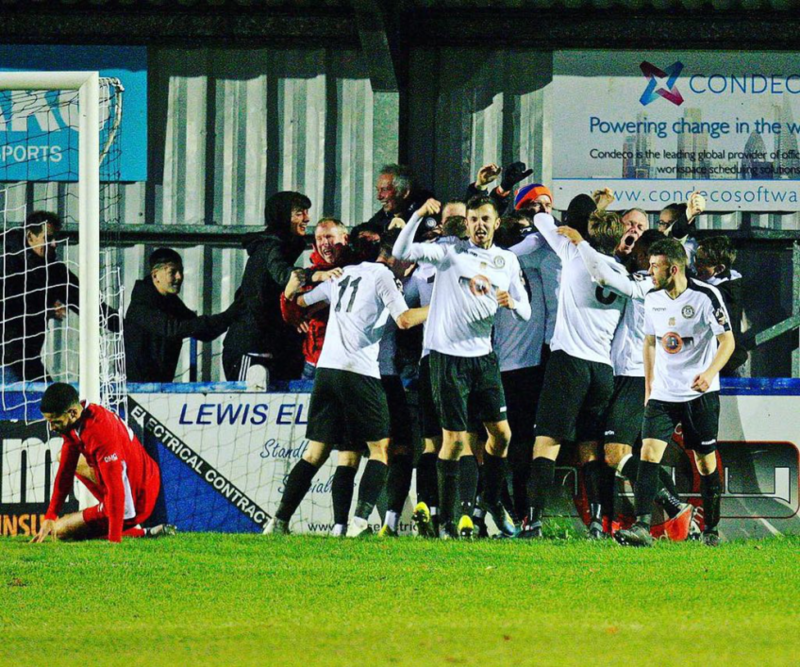 Under instruction from manager, Ian Herring, who sought greater tempo from his team, Hungerford broke quickly and committed more players forward. This provided for a more entertaining game as Blues sought to exploit extra space. Defences shone during this period with a series of towering headers from the away side’s, Inman, matched by the Crusaders’, Martin. The recent arrival to Bulpit Lane on loan from Birmingham City U-23’s was an impressive presence. 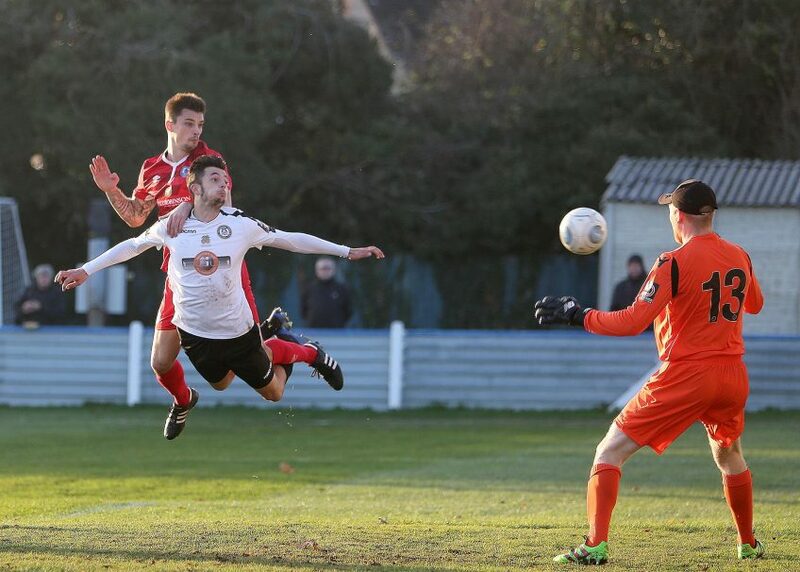 The second half saw another exchange of chances as Modeste only just failed to get his head to a far post cross while, on 49 minutes, Hungerford’s defensive midfielder, James Rusby, shot wide of goal from 20 yards. Rose, who remained a lively presence, was next to trouble the Billericay back-line forcing Howells to block a 52nd minute shot on goal for a corner. Ritchie Whittingham maintained the attacking momentum moving into space but shooting over the target. The visitors absorbed the pressure well and struck back through Jake Robinson. On 58 minutes, Billericay’s top scorer latched onto a through ball, wriggled past the attentions of Martin, and hit a powerful shot. Home goalkeeper, Jacob Weaver, also a Birmingham City U-23 loanee, saved well at his near post after reacting to swiftly to narrow the angle. Within 60 seconds, Robinson had another goal attempt but, under pressure from Marvel Ekpiteta, his shot was wayward. Billericay had been comfortable under pressure but paid the price for failing to score the second goal. A moment of brilliance from Rose on 66 minutes saw Hungerford grab a deserved equaliser. Collecting the ball about 22 yards from goal on the right-hand side, the winger composed himself and curled an unstoppable strike up and over goalkeeper, Julian, into the top corner of the net. Brennan reacted by changing the Blues strike-force, sending on Moses Emmanuel and Adrian Coombes in place of Modeste and Robinson. An injury to Ross Lafayette just before the equaliser had seen Cunnington enter the pitch as Billericay’s first substitution. The changes appeared to disrupt the team’s shape as Hungerford subsequently broke dangerously on the counter-attack. On several occasions, saving tackles from Billy Clifford, O’Hara, and Howells were required. Exemplary all afternoon, a Weaver mistake on 81 minutes almost let in Billericay forward, Coombes, as the ball went past the keeper leaving the ex-Welling Utd striker with a clear view of goal. That he did not score was due to the timely arrival of Hungerford’s Johnson-Schuster who sped back to slide in and block. With the game entering its final moments, a shot from O’Hara just wide seemed to be the last threat on the Crusaders’ goal. Added time, which lasted 7 minutes, proved to be the height of the drama as the match ended with a thrilling finale containing a further goal apiece for the two sides. On 90+4, Billericay’s vulnerability to the re-start was apparent yet again as a Hungerford corner was not dealt with by the defence. With a home head winning the first ball to force Julian into a diving save, Martin was well placed to scramble the rebound home from close range to score what seemed to be the winning goal in a remarkable turnaround. Incredibly, there was still time for Billericay to level once again. Inman, already secure as Blues Man of the Match, swooped to equalise with a powerful header after a deep cross from Deering to the back post was headed into the danger area by Cunnington. Immediately after the goal, the whistle sounded for full-time. 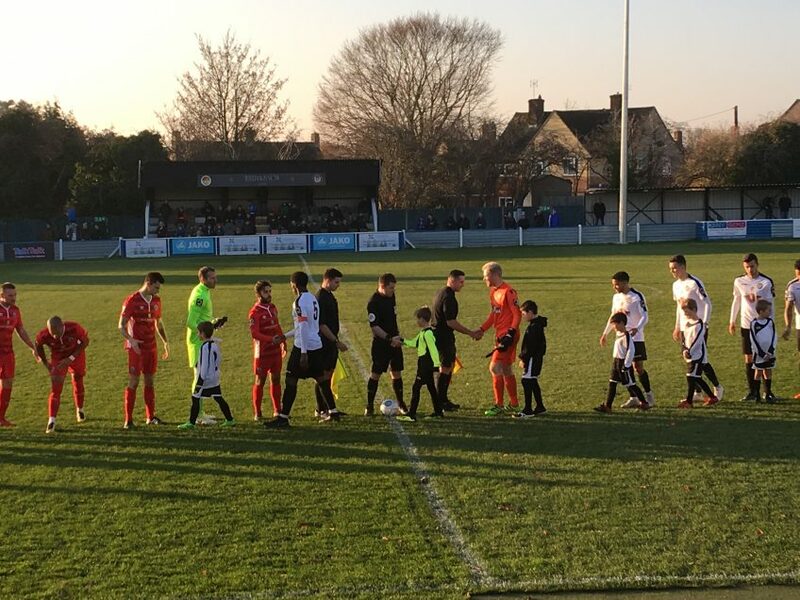 Although a win at struggling Hungerford Town was expected, the home side put in a resilient performance and made it difficult for the Blues. With a last minute equaliser, the game has ended on a positive note for the Essex faithful, With set piece specialists, Chesterfield Town, visiting the AGP on Tuesday, resolving the tendency to concede goals from restarts will need to be addressed once again. From the Hungerford perspective, the team showed that Bulpit Lane is a difficult place to visit. There is every chance that better home form can be developed on which the team can build a run of form and accumulate some points in the League. An honourable draw with the League leaders should help confidence and shows that they have the potential to match any side at home on their day. “Hugely influential at the back, regularly winning his aerial duels and distributing the ball well. In the right place to score his team’s second goal”. Goals: ’17 Inman; ‘90+7 Inman.